PLEASE NOTE: JBMail is no longer developed, supported, or sold. There will be no further releases. There may be security vulnerabilities in this software, though the author is not aware of any exploits. if you wish to continue using JBMail beyond 2013, keep the DLL files up to date. I'm happy to announce that JBMail Plus is now available for free! This full version previously required you to purchase license(s), but I'm now granting a free license to anyone with the "beta" version. All features (multiple profiles) are enabled. 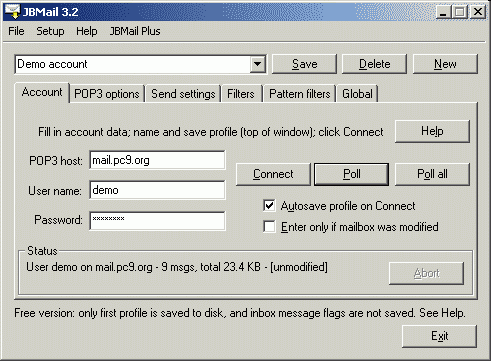 You can download JBMail Plus 3.3 beta3a in a ZIP file. There is no installer. All you have to do is unzip the	package into a new directory; see readme.txt (inside the ZIP) for further instructions. I can not provide any further support. Who might want to use this software? ROAD WARRIORS and MOBILE USERS who benefit from a streamlined mail client that leaves mail on the server and which doesn't force them to download all mail (saving time and bandwidth). The program itself is self-contained and portable, and does not require installation. SECURITY CONSCIOUS PROFESSIONALS who benefit from a clean, simple mail client that doesn't expose them to the security and privacy risks posed by HTML mail and script support. Attachments are decoded on demand only, ensuring that viruses are not automatically unleashed. HTML is never rendered, so advertisers can not track messages. USERS OF REMOTE SERVICES who require a properly implemented, yet easy to use SSL/TLS client for encrypted POP3 and SMTP transactions. Encrypted mail access is becoming the standard for business, academic, and government mail services. I.T. PROFESSIONALS who receive an excessive volume of daily mail and need powerful filtering capabilities. With direct mailbox access on the server, users can quickly clean and take care of incoming mail to reduce or even eliminate local mail storage. Easy access to multiple profiles makes managing many accounts easy. JBMail Plus is now free! Updated OpenSSL libraries. The latest JBMail Plus package includes OpenSSL 1.0.1e (2013-02-11) for better security. PGP, via external GnuPG software. Once all keys are setup in GnuPG, the composer allows you to sign and encrypt emails, or decrypt and verify signatures. There is no key management in JBMail. Various user interface enhancements. Composer can now auto-complete addresses; partial support of mailto: URLs; file associations for .JBM (stored emails viewable in JBMail); search feature in address book. Supports POP3 and SMTP; MIME; base64 and UUencoded attachments; ISO-8859-1 (Latin1) Western European characters; and many other standard features. Also see the Online Manual. Learn about MD5 signatures. This full version is now FREE! Thailand's c9c networks exclusively recommends JBMail to its customers. As of summer 2003, "JBMail 3.2 is the only one e-mail software for full security recommended by c9c"
JBMail was reviewed in the July 17, 2003 issue of Lockergnome, an extremely popular tech newsletter. Meryl wrote: "it's for people on the go that need a way to portably manage e-mail... It's lightweight and ideal as a secondary e-mail client." A lengthy review of JBMail was published in the December 2001 issue of Switzerland's PC-tip Magazine. JBMail has also been distributed on CD alongside the magazine, and has been a Top 10 download at the web site. Alan Winstanley reviewed JBMail in the November 2001 issue of UK's Everyday Practical Electronics Magazine, and wrote: "JBMail works very well and in terms of time saved, it has proved to be a good investment for a busy Internet worker." JBMail is listed at thefreesite.com, home of "the Web's Best Freebies"
JBMail was reviewed in the April 2001 issue of the Quickbytes newsletter. Bill Platt wrote: "I have used this application extensively since first downloading it... JBMail is awesome! Get your copy today."